When Yvonne and Kevin moved into their period property they wanted to create more space while being sympathetic to living in a rural building with history. 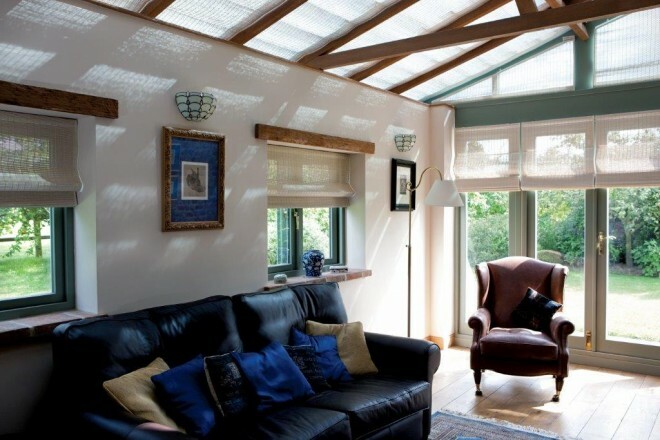 They called in Quayside Conservatories, who came up with a solution that worked perfectly for their needs. The couple chose French Pinoleum blinds from Grants, fitted within the glazing bars on the roof and inside the recesses on the windows and to the face of the doors at the front. They opted for a Flatweave finish in Grant’s Old Hardwick colour with a natural colour braid. “We really liked the French Pinoleum blinds as they look beautiful and you can see they will be hardwearing and will last a long time. 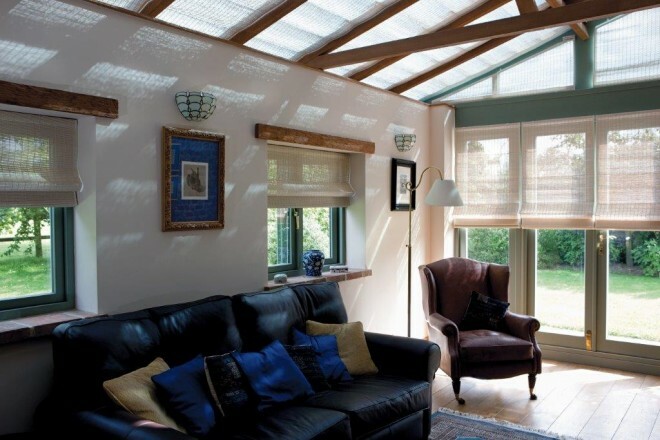 We looked at pleated blinds, but felt they would be a little stark for a conservatory such as ours. The couple wanted to ensure the room was usable all year round, which was why they felt strongly that they needed to choose exactly the right blinds. “This was our first summer and we found they made a huge difference. they keep the conservatory cool and, as we had so much sunshine this year, that was really important; it would have been unbearable. In the winter, too, they make the room feel much cosier. “We use the conservatory all year round in pretty much the same way and if I am away, my husband doesn’t bother to go upstairs to the other sitting room at all – he simply stays in the conservatory. “We went for motorised ‘blinds, which I’m really pleased about as it means we open and close them a lot. I think had we not, they would have stayed mainly closed or mainly open depending on where they were and we wouldn’t have taken advantage of their levels of flexibility. “When there’s a bit of winter sunshine I like to open them. I’m always saying to my husband that we should take full advantage of a bit of free heat.